Lasik or laser in-situ keratomileusis is an extensive and common surgery which is used to correct the vision problem like myopia presbyopia and hypermetropia. 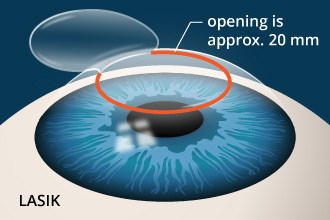 Lasik is a also used to reshape the cornea (clear front part of the eye). Why should You go for LASIK? The Lasik surgery is almost painless. A slight discomfort can be treated with eye drops. No bandages and stitches are required. As you age, changes can be made in the Lasik procedure to correct the vision. You can see correctly on the same day as the operation. The entire procedure will take about 10 minutes to complete. The LASIK is performed under local anaesthesia which is given to the patient in the form of eye drops. During the Lasik eye surgery, the femtosecond or microkeratome laser is used to create a thin flap in the cornea which is then peeled. By using another laser, the underlying corneal tissue will be corrected and reshaped. Once it is done, the corneal flap is placed back and the surgery is concluded. What are the Possible Complications and Risks with the Procedure? Some people might experience discomfort for a day or two after the procedure, but it will fade away in less than a week. The side effects of the method are rare but still present. After the surgery, you may temporarily feel dryness in the eyes. The condition will be treated with the prescribed eye drops and medications. The eye drops will prevent eyes from infection and inflammation. Eye drops might give a little burning sensation when you use them or they can blur your vision for a few minutes. Do not use any eye drops without the doctor’s consultation. Revisit the doctor for a follow-up check-up within 48 hours. You will experience the improved vision in a day or so. If you want, you can consult your doctor again after 6 months.